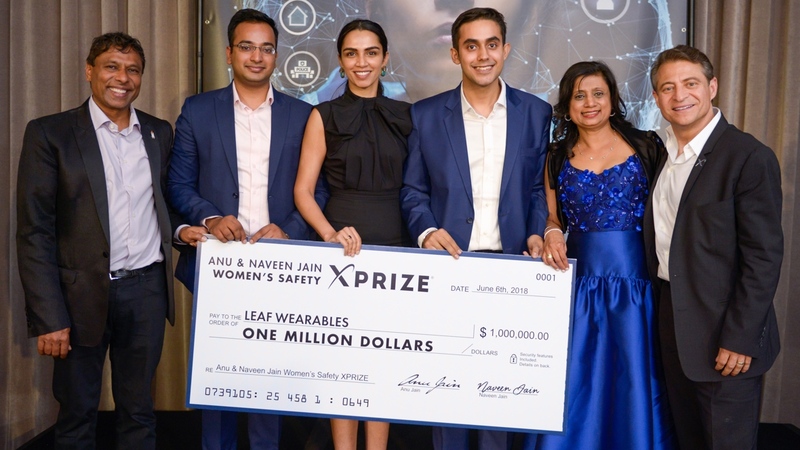 An Indian startup's personal safety wearable has taken home $1 million as the winner of the Women's Safety XPrize. Leaf Wearables' Safer Pro, a small chip that can be embedded into regular jewellery, is able to discreetly trigger an emergency alert with a double-press, instantly transmitting location information to select contacts. If a wearer is also feeling unsafe or just wants to check in, a live location can be activated, and audio can even be recorded to potentially provide evidence at a later date. By demonstrating that it was able to keep users safe through these SOS features, and still remain under the competition's $40 limit, and therefore remain an affordable solution, the New Delhi-based company was able to survive multiple rounds of judging and was selected from 90 other hopefuls to win the contest. For those who've not heard of the XPrize previously, it's essentially a series of competitions that test companies from around the globe to solve problems facing women. "Safety is a fundamental human right and shouldn't be considered a luxury for women. It is the foundation in achieving gender equality," said Anu Jain, co-founder of the Women's Safety XPrize. "With so many advances in innovation and technology today, it was unacceptable to us that we didn't have a solution to help curb this sexual assault pandemic. Of course, the Leaf Wearables isn't the first startup to explore this issue. In fact, we recently spoke to another Indian startup, Xenxo, tackling the same issue with its S-Ring and raising north of $500,000 on Kickstarter. However, it's rare that a financial platform is set like this for a smaller company, and we expect to see Leaf form part of the group making the world a safer place for women. And that group could also include some of the companies it outlasted in the competition, with the four other finalists impressing those involved with the project and each receiving a $50,000 investment.